"Using several layers of cardstock and just water you can mold the paper to form wonderful shapes and create a unique edge to your layout." 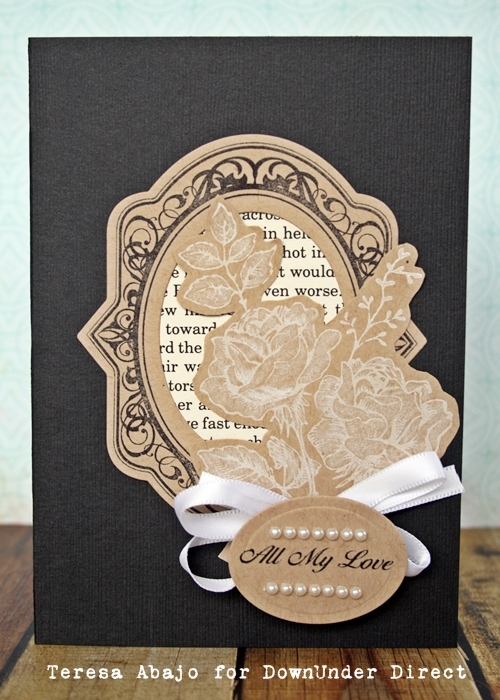 "Sympathy cards are never an easy task for me. 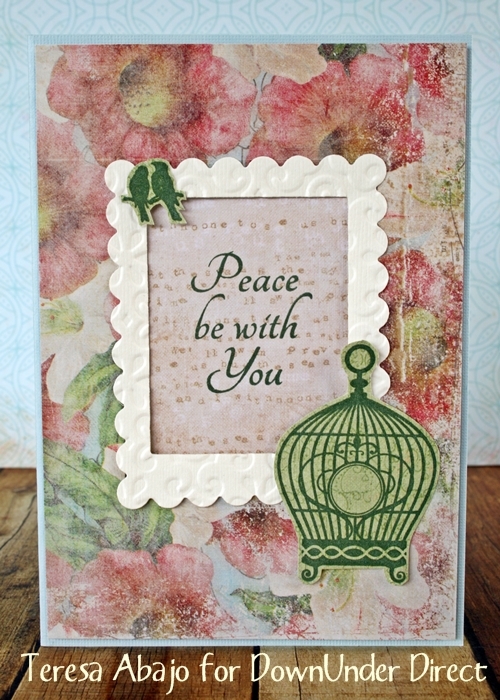 The new With Sympathy set from JustRite stamps has some beautiful words of encouragement in an elegant, understated font." Enameling the Spellbinders Bird cage gives a lovely rich look to this card. 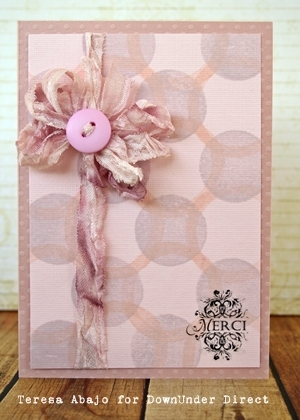 Today we have a layout from Sheree featuring more of the new JustRite Cling Stamps. "Although this card has a sentiment from the With Sympathy set, it needn't only be used for someone who is grieving the loss of a loved one. It's suitable for anyone going through a difficult time." "This homely wicker heart was just a inexpensive item decorated with scrap cardstock for a birthday present with a personal touch." "The detail in the JustRite Clear Stamps is extraordinary. Teamed with a good ink like Versafine, it's possible to achieve the crispest of images. I used the Classic Scallop Borders One set to make my own trims to embellish this layout. I also experimented with adding Blingabilities directly to photos - success! The iron will burn the photo, but certainly not under the protective plastic film. It just required a little manoeuvring with the iron and turning of the photo to ensure the iron didn't make direct contact with the photo. It's a great way to highlight the subject of the photo." "Stamping an image in white ink and then shading it with white Prismacolor pencil is one way to achieve a subtle, subdued look that is appropriate for solemn occasions. It's a lot easier than you think!" 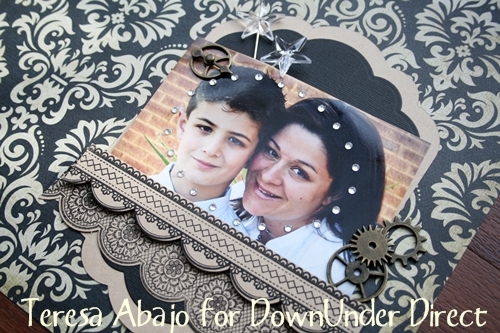 Here is a lovely idea to incorporate your JustRite Stamps and Spellbinder Dies into a keepsake project. 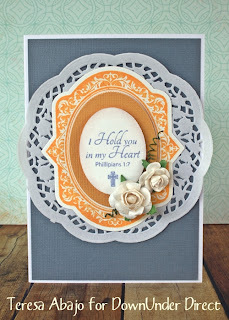 I just love the latest Medallion stamps from JustRite. 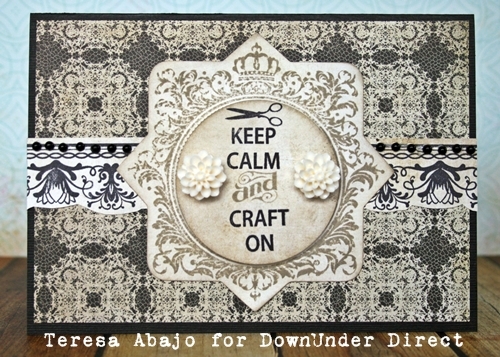 The Coordinating Dies make creating a stunning card very easy. "This is a card that's going to someone who'll appreciate the humour of it all - a fellow crafter." 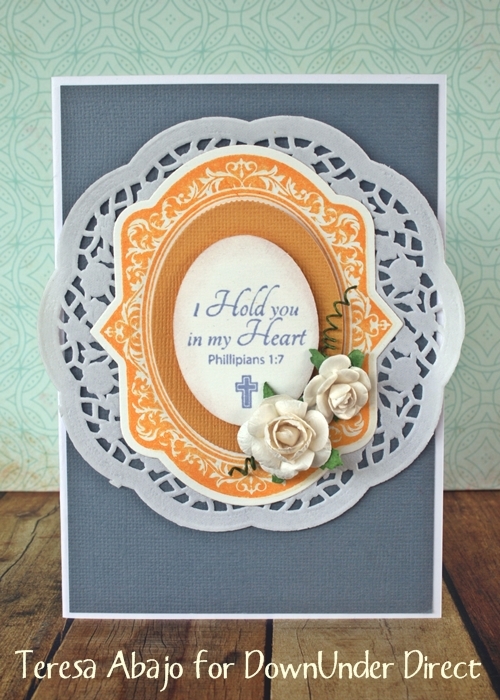 Today we have two cards using two very versatile dies. Grand labels Four as the card base and Rose Creations. "It is amazing how every time you make a flower with The Rose creations die, all you have to do is change one thing and it will turn out different." "Using Rose Creations to cut shapes from light weight chip board and painting them with metallic paint, gives you a new look to flowers." 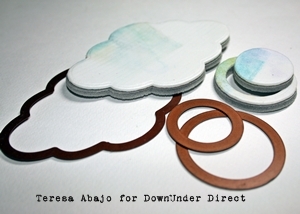 Bazzill cardstock gives you endless colour Challenges, this one is Cream Red and teal, one of my favourite. 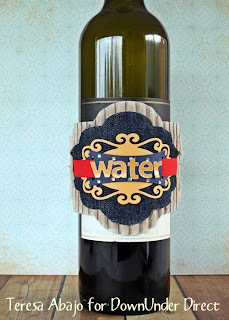 "There's a trend at restaurants to serve chilled water out of repurposed wine bottles. I thought I'd make something to decorate the bottles we've been saving for an upcoming party. I've used these colours because they coordinate with our theme, but naturally it can be customised to suit your own event." "With the new Bitty Blossoms die you can make loads of little flowers and I just love to drench them in white glitter, they look just like sugared roses. " Today we have another card featuring the newest JustRite Designs. 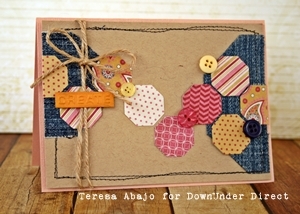 Today's tutorial is a card inspired by a petal fold envelope. This would make a lovely wedding or shower invitation. Score each piece from side point to side point. Measured the scored section and cut two squares the same size. The distance on mine is 12.5cm so I cut two 12.5 cm squares. Cut off each one approximatly 1.5cm from the score line. 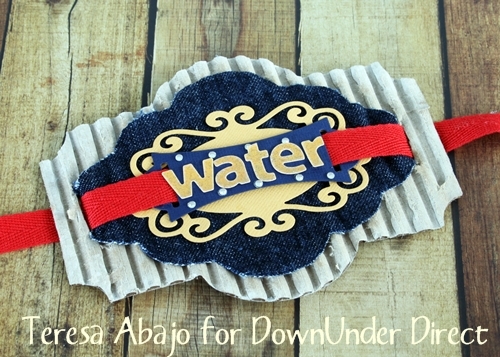 Apply a piece of double sided tape to the textured side. Attach all four panels to the smooth side of the first square. Apply tape to the smooth side of the second square and place over top of the first one. Place the corresponding die onto the image and secure with some sticky tape to hold in place. Attach two pieces of adhesive Velcro to keep the card closed. "The stripy pattern on the Ribbon Background stamp gave me the idea to colour each stripe in a different colour to resemble a rainbow - what better way to cheer someone up than with a rainbow? I used a different colour Distress Marker on each stripe, colouring onto the rubber stamp directly. It doesn't matter if the ink dries out - all it takes is a 'huff' of air and the moisture in your breath is enough to reactivate the ink." Today we have a lovely layout from Sheree. 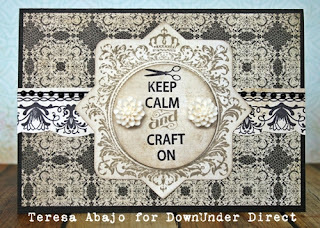 Today we have another card that uses the technique that we showed you on Monday-Making background stamps using Spellbinders. 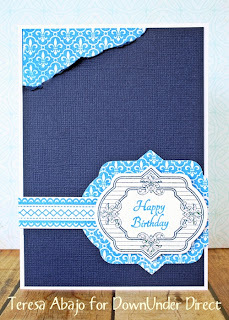 "A birthday card for the lover of blue. 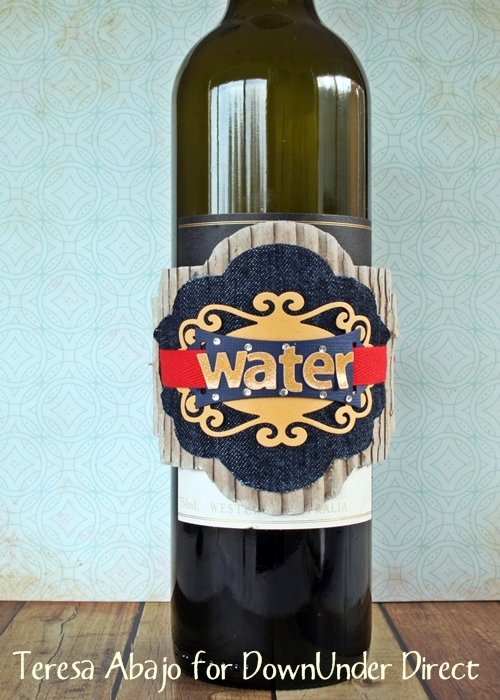 I'm quite impressed with how sharply the JustRite Background stamps turn out, and I love that I can have ribbon (or an image of ribbon anyway) in a perfectly coordinating colour." 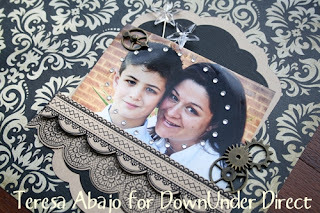 "I wanted to use some of the lacy elements of Spellbinder Dies to frame my photo, I had seen this effect on a DVD cover and used it as my inspiration." 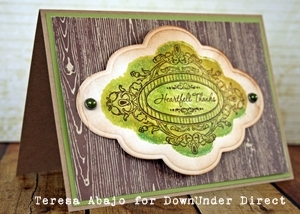 The Anemone flower die makes a lovely water lily perfect for the front of this elegant card. 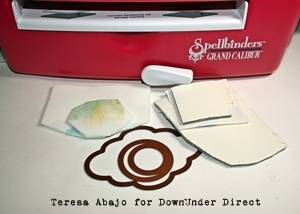 Here is a clever idea to make solid background stamps using your Spellbinder Dies. 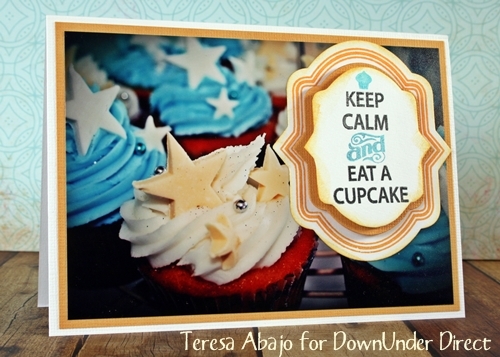 "I needed a solid background stamp for a one layer card one day, and decided to make my own stamps using craft foam and my Spellbinders dies. This was almost too much fun!" Cut each shape out of foam, and then EziMount. You might need to run each through the Grand Calibur a couple of times to make sure it has cut through. Once cut, peel the protective film off the EziMount and adhere it to the foam shape. Voilà! Your stamps are ready to roll. 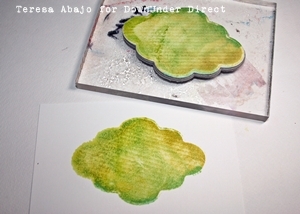 Ink these stamps the usual way with an ink pad, or smear dye inks (eg Distress Inks) over the foam and spritz with water. The colours will blend together to great effect. "Have you noticed that octagons and hexagons and all sorts of geometric shapes are everywhere at the moment? This is my little homage to geometry!"